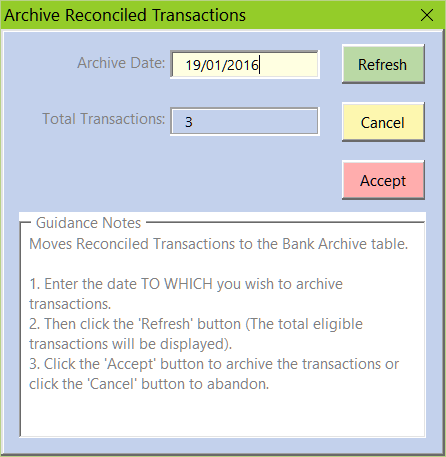 Bank statement transactions that have been reconciled can be moved to the 'Archive' table. The main reason for this 'Archive' process is to segregate transactions for different accounting periods. This process is normally undertaken at the accounting period year-end, however, transactions may be archived in advance. For example, following a bank reconciliation. Bank statement transactions that have been archived can be moved back the the bank statements table. This process is called 'Recall'. Archived Bank statement transactions for previous accounting periods can be permanently deleted from the Bank Assistant. This optional process is called 'Purge'. The purpose of this process is to help maintain an optimum sized workbook, sometimes referred to as 'Housekeeping'. Click on the 'Archive' button within the Dashboard. Note: The total number of eligible transactions and the LAST eligible transaction date are displayed as defaults. Enter a different date if required and click on the 'Refresh' buttion. Click on the 'Accept' button. Note: The total number of 'Archived' transactions processed is then displayed. 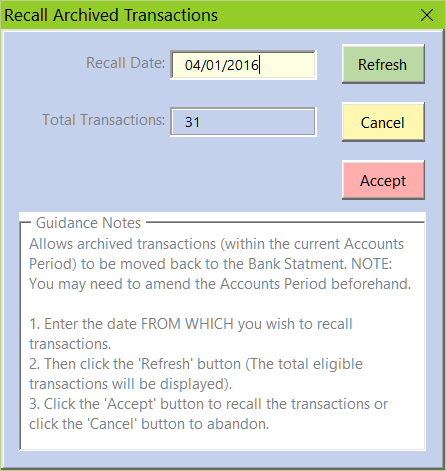 Click on the 'Recall Transactions' button within the 'Archive' tab of the Dashboard. Note: The total number of eligible transactions and the FIRST eligible transaction date are displayed as defaults. Note: The total number of 'Recalled' transactions processed is then displayed. 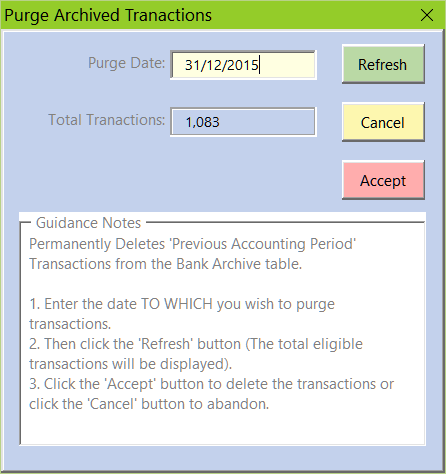 Click on the 'Purge Transactions' button within the 'Archive' tab of the Dashboard. Note: The total number of 'Purged' transactions processed is then displayed. Copyright © 2013-2019 Neilson James Technology - All rights reserved.